Kars, in far eastern Turkey, has a long history as a frontier, changing hands repeatedly between the Ottoman and Russian empires before becoming one of NATO's strategic outposts on the border of the Soviet Union. Today, though, Kars is striving to be a connecting point rather than a dividing line, as hub for one of the region’s most ambitious infrastructure projects. 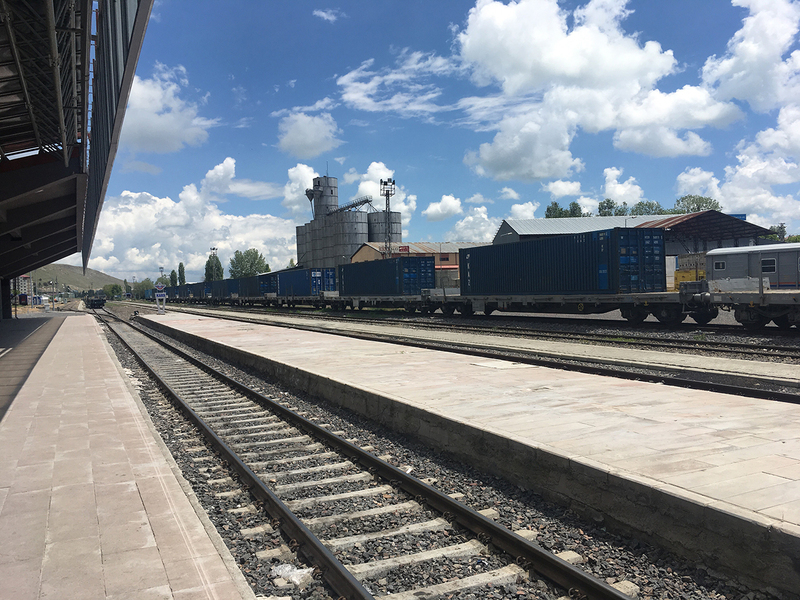 Since October 2017, the Baku-Tbilisi-Kars (BTK) Railway has been transporting goods between Kazakhstan and central Europe. In its current form, the railway is capable of carrying 6.6 million tons of freight each year, but planners are pushing to increase this to 50 million tons. The railway was first proposed back in 1993, after Turkey and Azerbaijan closed their borders with Armenia as a result of the conflict over Nagorno-Karabakh. A quarter century later, the first trains are rolling along this 846-kilometer connector, transporting goods from London to China in as little as 15 days. Fans of the project describe the South Caucasus as sitting at the center of an emerging Eurasian supercontinent – a market accounting for 65 percent of the world’s population and 75 percent of its energy resources. Yet demand for this railway, like many other trans-Eurasian infrastructure projects, has thus far proved disappointing. BTK operators at the Kars railway station recently told Eurasianet that only one train, with just five carriages containing agricultural products, had left the station that week. By the end of this year, the BTK is slated to begin transporting its first passengers, with backers claiming a potential 1 million travelers per year. But geopolitics, too, guides the future trajectory of the BTK. The Azerbaijani province of “Nakhchivan’s 12-kilometer border with Turkey is vital for the exclave’s security,” Shahbazov said. Ankara and Baku signed an Agreement on Strategic Cooperation and Mutual Support in 2010 under which Turkey is a guarantor of the exclave’s security. Planners are currently looking for ways to connect the railway network to Nakhchivan via Kars. Azerbaijani and Turkish officials have said they hope to work with Iran to build a BTK spur through Nakhchivan to Iran and Pakistan via a recently restored Soviet-era railway link between Nakhchivan and the Iranian city of Mashad. “Since the region is so important, we want another project linking Kars, Nakhchivan, Iran and Pakistan,” Arslan said. But Shahbazov says the railway projects' economic impact may be more mixed. Complementing Kars’s bid to expand into the Iranian market, Azerbaijan has put forward the capital to make it a reality. In January, Tehran accepted a $500-million loan from Baku to construct a 205-kilometer railway from Rasht to the Azerbaijani border (known as the Rasht-Astara line). Then in March, the foreign ministers of Iran, Turkey, Georgia, and Azerbaijan all met in the first-of-its-kind quadrilateral meeting. One regional country is conspicuously missing from all this integration, however: Armenia. Turkish officials hope the BTK can act as leverage over Yerevan to bring an end to the Karabakh conflict. “We are aware of the problem posed by Armenia,” Arslan said. “We want relations with Armenia too, but we have one important policy to meet this end and that’s to get Armenia out of Karabakh.” Arslan added that “if Armenia leaves Karabakh,” the Turkey-Armenia border would be opened, giving Armenia access to both the BTK and Kars-Nakhchivan railway.